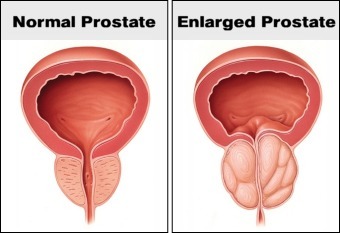 In healthy young men, the prostate is quite small, about the size of a walnut, which allows plenty of room for the urethra to be its normal size. However, as men get older, excess cell and tissue growth causes the prostate to enlarge. The prostate then begins to squeeze the urethra and block urine flow. This incredibly common condition is called Benign Prostatic Hyperplasia (BPH), also known as an enlarged prostate. Benign Prostatic Hyperplasia (BPH) can be terribly disruptive to your life. If left untreated, the condition can result in bladder stones, poor kidney function, infection, and other more serious medical problems. Fortunately, there are many options and choices of treatment available for men with BPH, depending upon the severity of your situation and any other health issues you may have. Today there are very effective, minimally-invasive surgical treatments that allow men to urinate much better and easier, and without any negative impact on their sexual function. Likewise, there are medications that can help manage the symptoms of BPH, thereby improving your quality of life. Expert Los Angeles Urologist Dr. Gary Bellman, M.D. has over 20 years of experience and has treated thousands of men with BPH at his SoCal Urology Institute practice. Dr. Bellman will explain all the options available to you to help you make the best decision when it comes to treating and managing your BPH.